Although still very weak, he can now walk unassisted for short distances before his back legs give out. He is still struggling a bit with bowel control, but gradually is regaining it. This dignified old fellow looks downright embarrassed ... even mortified ... when he has an accident. It really seems to affect his pride. He can't get up on his own, so he now wears a harness on his chest and we slide a wide strap under his tummy to help lift him up equally at both ends. Once up, he can get going under his own power. Sometimes he is so eager to go exploring again that he overdoes it and his hind legs drop. Then we scoop him up, turn him around, and help walk him back to the house. The only thing I miss -- and he does too, I know -- is that he can't join us on our morning and evening barn chores. This was always his special time of the day. He eagerly followed us everywhere as we made our rounds. A wonderful friend of the sanctuary suggested today that we get him a little wagon to ride in so we can pull him along. What a great idea! Of course, Pappy would rather be in the back seat of our Chevy pick-up ... it's folded flat, padded with cushions ... this is his favorite spot in the universe. He loves to go for drives in that truck! His next favorite spot is on his thick foam bed in the living room, where he can be in the center of things. That's where you see him in this photo I took today. A few short weeks ago we thought we were losing him. Every day we have him now is a gift. You can see his original story on our Web site here. Scooter and Sugar, the two disabled dogs we agreed to take from the Hayward (CA) animal control shelter, arrived at the ranch last night. Their trip to Montana was made possible only because of incredible volunteers. Garrett and Delores, volunteers from the Hayward shelter, drove the dogs all the way from the Bay Area to Spokane, Washington. Our own wonderful volunteer, Jerry B., drove over to Spokane from Missoula, picked up the dogs and brought them all the way back to the sanctuary. The deaf white female was originally named Delight, but Alayne took one look at her scooting around the yard last night and named her Scooter on the spot. She's a sweet, affectionate, frisky thing. (Scooter, although the same could be said about Alayne.) The nice thing about deaf dogs is it doesn't matter if you change their names, since they can't hear you calling them anyway. Scooter is still very much a puppy ... zooming all over the place. And, as you can see from these photos we took today, she figured out right away why we call this place the Rolling Dog Ranch. As I write this, Scooter is out in one of the big dog paddocks, playing with our deaf English Pointer, Tyler. The blind Springer Spaniel is now named Sugar. The volunteer at the Hayward shelter who contacted us about these two dogs, Terry D., decided to name her Sugar after learning we had just adopted out a blind Springer Spaniel named Cookie. So ... Sugar ... Cookie. Cute, huh? We thought it was perfect. Here she is with Alayne this evening. Sugar is an older girl -- probably 7 or 8 -- and she can't see a thing. She's blind from a combination of cataracts and glaucoma. She's very timid at first, but as soon as she realizes you're going to pet her, she just starts wagging her tail. She usually has a 'concerned' look on her face, but I think she'll develop confidence pretty soon. This sweet dog must have gone through so much upheaval in her life recently ... it's hard to imagine what's going through her head now. But she'll quickly realize she's safe and loved ... and she'll start to blossom. We're suddenly having banner "issues" with the blog tonight. Our sanctuary logo is blowing out the margins of the banner one minute, the next it's too small and off-centered. We tried re-posting it, then re-sizing and re-posting it, but nothing seems to work. Oddly, it is still fine on the About page. We finally submitted a help ticket to the Typepad support team. So if something looks very strange up above ... we're working on it. If it looks okay ... then we got it fixed. This is one of our weekends when we're closed for visits, which gives us time to do the basic ranch chores that just have to get done. In between other chores today, we picked up the first of 100 tons of grass hay we're buying from our next-door neighbors. For the past couple of years we used big round bales (1,000 lbs +/-) and moved them with the tractor and a round bale spear. We'd pull off the hay by hand and feed to the horses that way. For a lot of reasons, we're switching back to small square bales this year. 'Small' being relative, of course ... these bales are about 70 lbs each. So we hitched up the flatbed trailer and drove over to our neighbors this afternoon to pick up the first ton fresh from the fields. What you see on the trailer is that ton ... 28 bales total. Because we converted our hay barn to a horse barn two years ago -- it wasn't big enough to hold more than 25 tons anyway -- we will store about 90 tons in our neighbor's hay barn. We'll take about 10 tons initially and pick up the rest throughout the winter. In case you're wondering, each ton costs $95, for a total purchase of $9,500. We agreed today to take two disabled dogs from the Hayward, California animal control shelter. 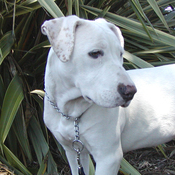 One is a deaf female hound mix named Delight. She's young, about 8 months. The other is a blind Springer Spaniel ... she was dumped in their holding pen overnight, so she doesn't even have a name. The shelter believes she's probably about 7 years old. Both of these dogs were facing euthanasia. We're working now on travel arrangements with a wonderful volunteer named Terry D. who first contacted us about them. Terry is responsible for rescuing blind Penny and sending her our way earlier this year. At this time of year flying dogs via the airlines is tricky because of the temperature restrictions and summer heat. So we're also looking at ground transportation options. 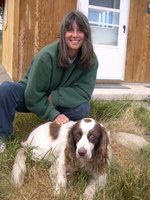 Ironically, we just had a blind Springer Spaniel named Cookie who we adopted out to a young lady in Seattle several weeks ago. We always are glad when we can adopt an animal out to the right family, because it frees up a spot for another disabled dog. Here's a photo of the Springer from California. 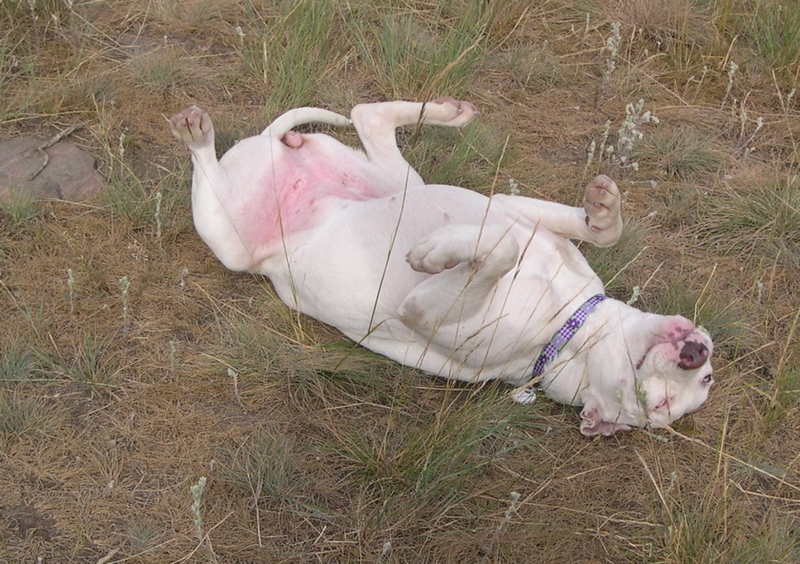 Popeye came to us at the tender age of 3 weeks from Spokane Animal Control. He had been dumped in the overnight bin outside the shelter. His front legs were bent inwards from a condition known as a "varus deformity" ... two bones in each leg were growing at a different rate. This little scamp immediately captured our hearts. He had no idea his legs were oddly shaped, and they didn't slow him down at all. As the weeks went by, his legs started straightening out, and soon it was hard to tell that anything was different. You can see Popeye's original story here. Last week, a nice young lady in Missoula named Carmen U. saw Popeye in our summer newsletter. She called to ask if he was available for adoption. We said yes, and Carmen came out this past weekend to visit with Popeye. It was love at first sight, and Popeye went off to his new family in Missoula. Today Carmen e-mailed us to say, "Just wanted to let you know that little Popeye is such a joy! I think he's very happy in his new home -- purring all the time, checking out every nook and cranny, and getting to know the boys and the other animals." 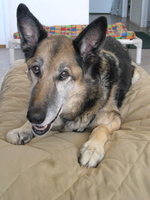 Our old German Shepherd, Pappy, is well on his way to recovering after 10 days in the vet hospital in Helena. I had taken him in one morning after finding him listless, with no appetite, and a high fever (105.7). Turns out he had pneumonia. Last Sunday, July 10th, our vets had called and said he could come on Monday. But on Monday morning they called to say Pappy had suddenly come down with meningitis and that I should come over to be with him "just in case." Just in case he didn't make it. I hopped in the truck and drove like mad the 70 miles to Helena. A spinal tap and analysis of his fluid confirmed the meningitis diagnosis. Our vets gave him a 20% chance of survival. He looked and felt awful. He didn't respond to me, didn't even seem to realize I or anyone else was around him. Just a blank look. I waited until a vet tech arrived from St. Peter's Hospital with the special meningitis drug and watched as they injected it into his IV and trickled into his veins. I kissed and petted this special old boy and left in tears, afraid I would never see him alive again. All that night we waited for the phone to ring. It didn't. The next morning the report was astonishing. Pappy was alive, alert and eating ... and his temperature had plummeted. Every day last week we waited for the twice daily call from our vets with the update. Each day came and there were no setbacks. Only slow, steady progress. Gradually we allowed ourselves to hope. Our vets cautioned against too much hope. Meningitis is a killer. In an old dog, it can be especially lethal. Last Wednesday I drove over in the evening to be with Pappy at the clinic. I wanted him to know we were still there. Then, on Friday, our vets said we could bring him home for the weekend if we wanted to. But it was our call. Clinically they would prefer he stay in the hospital, but they also recognized the therapeutic value of being home. And they thought the risk was reasonable. There was no doubt in our mind. I drove back to Helena Friday evening and picked him up. When I got back to the ranch with him, Alayne and I both cried. We didn't think Pappy would ever be coming home again. So far Pappy's doing great. He's eating, drinking, and alert. He's still very weak and needs help walking. He is struggling with bowel and bladder control ... less of the former, more of the latter. We have to get up during the night to help him. But he is steadily gaining strength. His temperature has stayed in the normal range. Our vets caution that he can still have a relapse ... the chances are as high as 50%. So every day is a blessing. You can see Pappy's original story on our Web site here.